The author of this article collected data over a 25-day period covering 244 outpatient visits. A detailed log of every patient's visit, their preexisting medical conditions, age, gender, and symptoms that prompted medical advice was created, in addition to the diagnosis and treatment rendered by the physician. This article intends to take the reader through the patterns of visit (acute vs. chronic) seen at the outpatient department (OPD), leading causes, and diagnosis for most OPD visits. Also provided are a correlation of preexisting medical conditions and associated orthopedic ailments, diseases, and complications in addition to their distribution between genders and age groups. Detailed records of all patient visits to the OPD, including their age, gender, preexisting conditions, past surgeries, current medications, orthopedic symptoms, pain reference, ensuing diagnosis, and treatment were collected through the 25-day duration of the study. All patient data were treated per privacy laws, and full consents were received prior to the assessment of their respective data. Through the duration of the study, a total of 244 Outpatients' data were collected, and they were recorded as either acute or chronic visits primarily based on the symptoms presented and secondarily based on the presence of prior visits for the same ailment. This study did not allow for any form of patient sampling and/or screening – the data collected through the duration represent the full data set and all analyses were performed on such data set. Data analyses primarily included application of simple mathematical ratios, percentages, and averages. The author neither qualify nor extrapolate that visit patterns identified in this study as representative of all patient visits to the hospital, especially outside of the study period. As mentioned elsewhere in the article, a total of 244 outpatients were seen and assessed during the 25-day study duration. 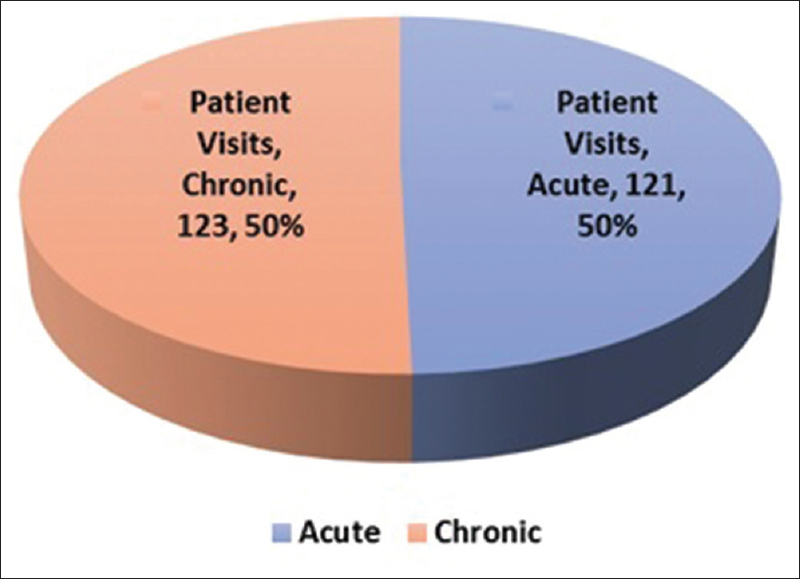 Out of the 244 patient visits, 121 patient visits were classified as acute – wherein the onset of symptoms was sudden and such ailments were not previously addressed by the physician. The remaining 123 visits were classified as chronic wherein the patients were either being followed up or monitored for management for known orthopedic conditions. [Figure 1] provides a visual representation of the observation. Similarly, out of the 244 total patients, 131 were female and 113 were male. The median ages of 47 and 50 years were observed for males and females, respectively. The youngest and oldest patient assessed were 2 (two) and 89 years old, respectively, and both were females. [Figure 2] provides a visual representation of this observation. 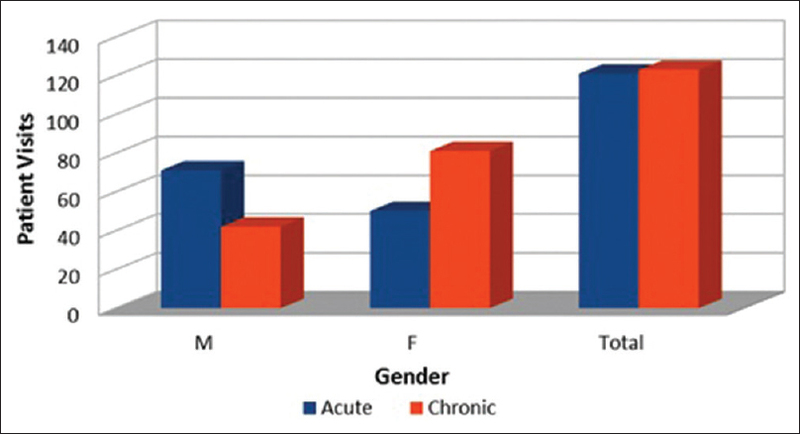 [Figure 3] indicates that on an average, twice as many males visit the OPD with acute conditions compared to females. However, the converse is true for females where roughly twice as many females report to the OPD with chronic conditions. Nevertheless, the ratio of acute-to-chronic visits is equally distributed when all patients (both males and females) are taken together. On an average, one out of five patients visiting the OPD had preexisting medical conditions that did or did not contribute to orthopedic symptoms, nevertheless, critical for accurate diagnosis and treatment. Data indicate that on an average, females visiting the OPD with preexisting medical conditions moderately outnumbered males with similar preexisting conditions. A closer analysis of the patient logs indicates that diabetes and hypertension, either as separate disease or their combination, were the leading preexisting medical conditions. 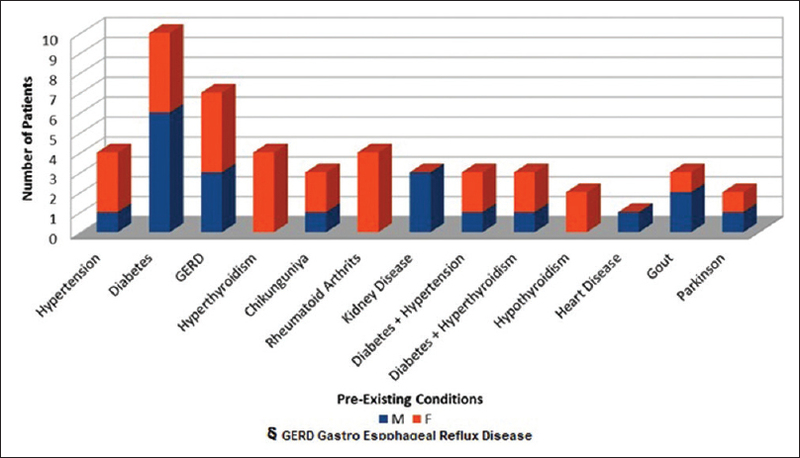 Thyroid diseases such as hypo- and hyper-thyroidism were second only to diabetes and hypertension in their affliction frequency, followed by arthritis (and gout) and gastroesophageal reflux disease, respectively, in that order. Interestingly, postviral arthritis due to chikungunya appeared to be another important preexisting medical condition, albeit one can expect such observations would be seasonal. [Figure 4] provides a visual representation of this observation across all patients reporting to the OPD. A closer analysis of the data indicates that within the group of patients with preexisting conditions, males were on an average younger diabetics and were visiting when their orthopedic symptoms (or symptoms caused by worsening preexisting conditions) worsened such as edema to the feet. Females were on an average older and were primarily visiting for issues with joints and spine, with diagnosis often pointing to rheumatism, degenerative disc disease (DDD), and spondylosis. [Figure 5] provides a visual representation of this observation. [Table 1] provides a brief snapshot of patients with preexisting medical conditions, their average age, and the most common orthopedic symptoms they presented while reporting to the OPD. Of the patients reporting to the OPD, it is evident from the data that female patients with acute symptoms were on an average younger than female patients with chronic issues. A similar trend is also seen with male patients. 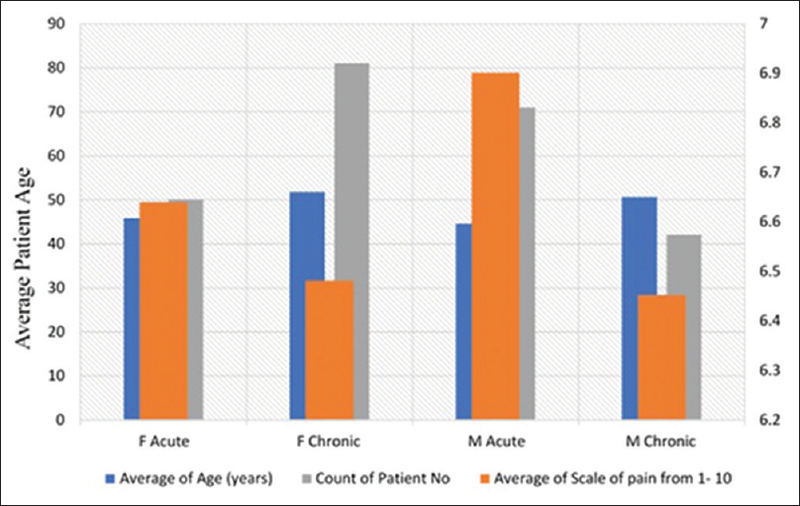 Further, the pain levels reported, on an average, by all patients presenting for acute issues are higher than patients with chronic issues. Interestingly, males reporting to the OPD with acute symptoms report the highest average pain levels compared to females within the same category. However, female patients with chronic issues and symptoms report relatively higher pain levels than their male counterparts. [Figure 6] provides a visual representation of this observation. 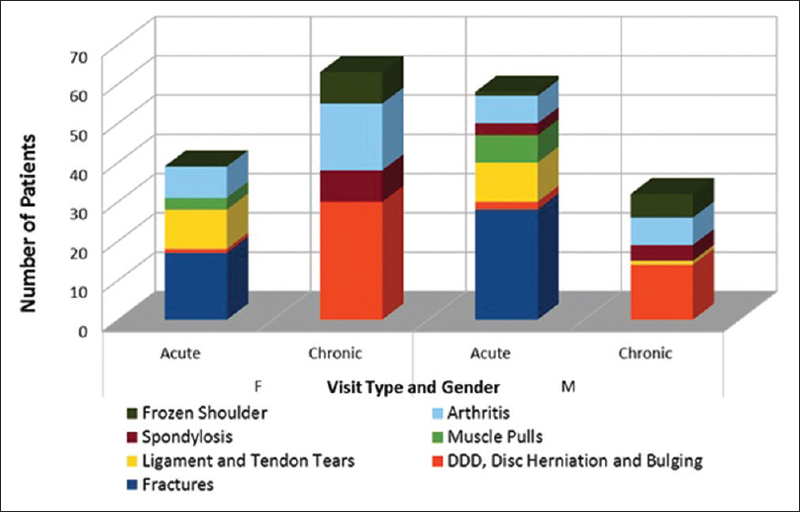 Further analysis of the data also shows that more than 30% of females report to the OPD with arthritis compared to males and every two out of ten female OPD chronic visits are due to arthritis. Interestingly, almost all rheumatoid arthritis patients visiting the OPD for chronic issues are older females. Further, roughly more than 10% of females report to the OPD with DDD than males. Between arthritis, DDD, and spondylosis diagnoses across which females, on an average, overrepresent in the OPD – one could likely explain that the relatively higher pain levels of female is possibly due to painful chronic conditions such as rheumatoid arthritis and DDD. [Figure 7] provides a visual representation of this observation. It is clear from the figure that roughly eight out of ten patient visits to the OPD are diagnosed with the above orthopedic conditions. Moreover, within the patients that report to OPD with acute symptoms, fractures take the major part and DDD takes the major part among patients reporting for chronic conditions. This observation, interestingly, coincides well with Pareto principle. The observed overrepresentation of males in acute and females in chronic visits, as observed in [Figure 3], appears consistent with observations by others, even in developed countries. Contrary to commonly misplaced conclusion that males are genetically predisposed to enjoy healthier lives than females, the more likely explanation for this observation is that males are more likely to seek medical attention when they are afflicted with lifestyle-altering afflictions and are not particularly consistent in follow through with their physicians, especially for known medical conditions. Females, on the other hand, have been observed to be relatively more prompt in seeking medical advice and more prompt in follow-ups for preexisting conditions. Both likely explanations are likely the probable fits to the observed patient representation at the OPD. Similarly, the observation of high incidence of diabetes and hypertension, in [Figure 5], among patients visiting the OPD is fairly aligned with observations by others that note Indians (as ethnicity) to be among both high risk and high incidence rates for both diseases. Although there are circumstantial data available to explain the incidence rates of both diseases being genetics, it is equally likely that diet and lifestyle (exercise, smoking, and drinking or lack thereof) play a role in the high incidence rates observed. Further, observation of younger male diabetics at the hospital's OPD is the most likely sample and standard errors within the data, especially considering that data collection only represents the duration of 25 days. Further interestingly, as presented in [Figure 8], although twice as many male patients report to the OPD in acute cases as females, the ratio of females to males with preexisting conditions reporting to the OPD in acute and chronic visit types quadruples. 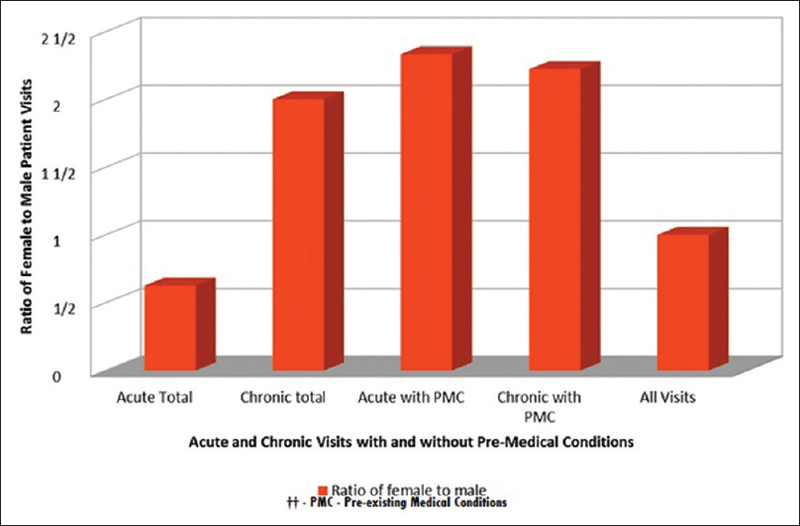 Simply put, there appears to be twice as many female patients with preexisting medical conditions reporting to the OPD in both acute and chronic visits. 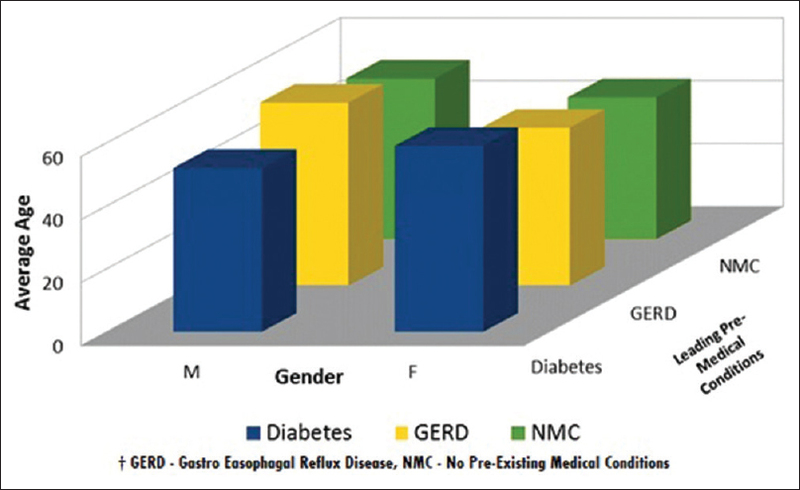 Nevertheless, the overall female-to-male patient ratio of all visits to the OPD is 1:1, indicating that the previously discussed explanation of males not following through with preexisting conditions and/or seeking advice only when symptoms become lifestyle changing, in contrast to females, still holds reasonable ground. A closer observation of the data in [Figure 6] indicates as to why males with acute symptoms present higher pain levels. On an average, four out of ten male patients reporting to the OPD with acute symptoms are diagnosed with fractures. Further, two out of ten and one out of ten male patients are diagnosed with torn ligaments/tendons and muscle pulls, respectively. Simply, 70% of all male patients reporting to the OPD with acute symptoms are fracture, torn ligaments, and/or muscle-pull patients. A similar trend of the incidence of fracture, compromised ligaments and tendons, and muscle pulls is seen for female patients reporting to the OPD with acute symptoms. However, the incidence of fractures is roughly 10% lower in females as compared to their male counterparts. Interestingly, however, females reporting with acute torn ligaments and tendons are roughly 40% more than their male counterparts, which particularly does not describe why females still report lower pain level than males. There are some preliminary data to suggest that acute fractures presented by males at the OPD often tend to be compound and major; however, it is premature to conclude this in the absence of larger sample set. Elderly patients with severely limiting preexisting medical conditions (i.e., compromised kidney functions and severe diabetes) presenting complex fractures requiring surgery require nontraditional local anesthesia-based surgical procedures. Such surgical procedures are novel and require healthy adoption by other health-care practitioners. This study was financially supported by the chief orthopedic surgeon and proprietor of Anjali Memorial Hospital, Vadodara, Gujarat, India. Statistical Data on the Internet, Center for Disease Control, Statistics Division. Available from: https://www.ftp.cdc.gov/pub/Health_Statistics/NCHS/NHIS/SHS/2014_SHS_Table_A-18.pdf. [Last accessed on 2018 Sep 25]. Statistical Data on the Internet, Harvard Health Beat Publication and Awareness. Available from: https://www.health.harvard.edu/blog/why-men-often-die-earlier-than-women-201602199137. [Last accessed on 2018 Sep 25]. Mohan VJ. Why Indians are more prone to diabetes. Assoc Physicians India 2004;52:468-74. Statistical Data on the Internet, Center for Disease Control Factsheet. Available from: https://www.cdc.gov/tobacco/data_statistics/fact_sheets/adult_data/cig_smoking/. [Last accessed on 2018 Sep 25]. Statistical Data on the Internet, US Social Security Office Statistics. Available from: https://www.ssa.gov/planners/lifeexpectancy.html. [Last accessed on 2018 Sep 25].